We strive to achieve 100% customer satisfaction and are delighted to hear from our valued customers with their thoughts and reviews. If you would like to know if PlumbNation is a trustworthy company then please do read through the PlumbNation customer reviews. We value each and every customer and guarantee that all customer reviews and testimonials listed on this page are credible and genuine. We hope our reviews will provide accurate insight into the typical feedback we receive and will help assure you that you can shop safely with us in confidence. 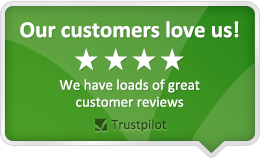 Our genuine customer reviews are submitted to the independent third-party review portal, Truspilot. Below is a list of our most recent 5 star reviews and our overall score.